One of my all time favourite desserts is Lemon Tart (or Tarte au Citron when I'm feeling posh). So when I was looking for a suitable Nigel Slater recipe for Dish of the Month, and I found Lime Tart amid the January recipes in Kitchen Diaries I, I knew I had found my bake. Dish of the Month is a new blogging challenge organised by Janice at Farmers Girl Kitchen﻿ and Sue at Heaven on a Plate. 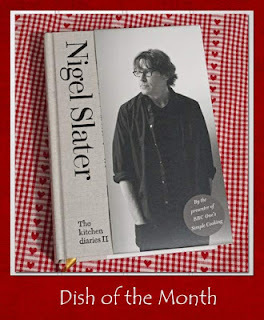 The aim is to prepare a Nigel Slater recipe every month and share your post via a linky. It's inspired by a love of Nigel's writing and recipes in the Kitchen Diaries II, but you don't need to confine yourself to that particular book. I must admit that while Kitchen Diaries I and II is fairly regular bed time reading for me, I haven't tried many of the recipes. But ever since buying Appetite when it was published, I love how Nigel writes, and when he writes about, for example, the perfect knife, melded into his hand with just the right weight, I get it. It's so evocative, I can almost feel the handle nestling into my palm. I knew, therefore, that I wanted to give this challenge a go. Mainly so I had a reason to finally explore Nigel's culinary world. I'm going to try and keep with the seasonality of Kitchen Diaries though and work through month by month. The recipe for this month's Lime Tart is available on line here (scroll down past the Treacle Tart - if you can!). I'm just going to add a little about my experiences, as sadly, it didn't all go to plan. The first thing I noted is that the recipe available on line actually differs slightly in the pastry ingredients from that found in Kitchen Diaries. On line, it states 50g of icing sugar and 1 egg yolk. This becomes 40g icing sugar and 2 egg yolks in Kitchen Diaries. I went with the Kitchen Diaries version, but as I can easily panic about pastry, felt a little unnerved that Nigel had two versions for the same recipe. I couldn't see the reason for it and my mind was nervously wondering why. In making up the pastry, I found the method unusual, too. Nigel says that the pastry is too delicate to roll out, so his method involves rolling it into a log shape, chilling, then cutting thin discs from this which you press into your pan. Knowing that pastry should be handled as little as possible, or it shrinks, again I was nervous. At first, I also thought that I wasn't going to have enough pastry, and thought I was cutting the discs too thick. But as I artfully arranged them around my tin, it all worked out and looked pretty impressive. It took a while longer than simply rolling out. But 'Phew!' I thought. Closely followed by 'that was fun - I can do that with Sam when he's a bit older. He'd enjoy it'. Having assembled the pastry, I put it to chill for 30 minutes before baking. The baking was where it went wrong. The discs of pastry had shrunk to reveal cracks, like fault lines, all the way across the bottom of the shell. It was a bit like witnessing continental drift in action, hence the title of this post. There was no way I was going to be able to pour filling into it, as it would just pour back out again. Tasted nice though, with that sweet crunch you want from a dessert pastry. I didn't know if it was me and I had done something wrong, or it was the method. But feeling very disloyal, and running out of time that day, I decided that I had to try another method and recipe to prepare a shell, as this one clearly was not going to be used. I tried another batch basing it on the pastry for Cranberry Meringue Pie. But, oh no! This one was even worse - the edge of the pastry simply collapsed so that I ended up with something that loosely resembled a deep dish pizza base. So out came attempt number 3. This time I used a Rachel Allen pastry recipe. I didn't bother taking a photograph of this one. Again, the pastry was lovely and crisp, and tasted gorgeous (so much so that Mike dove into it eating it like a snack). But the sides had developed vertical cracks so that again, the filling would just leak out. By this time it was 10.00 pm and I had to give up. I had made the filling up ready for tart shell number 1, but refrigerated it as soon as I saw the problems. I decided to try and salvage it by keeping it in the fridge until I had a chance to make another shell. Yay, Finally! Attempt number 4. So today, attempt number 4 has finally worked. I went back to a recipe that I have used before - from Eric Lanlard's 'Tart it Up' - and in an attempt to understand exactly why I was having so much trouble with the pastry, did some on line research. One of the sites I came across was this fantastic blog, Azelia's Kitchen, which is amazing. Azelia's step by step photos reinforced everything that I felt I knew about pastry, and gave me some new hints and tips for method. Back on the right path following her suggestions, and with Eric's recipe, after blind baking I ended up with a shell I was proud of. This time, I used a larger, but shallower tin, and so the filling baked in about 30 minutes. Despite a scare when I nearly dropped the completed tart moving it for the photographs, it survived. Oh my, oh yes. The filling is gorgeous and chilled, with the crispy pastry, it was worth every damn, agonising second. Even if it is now Nigel Slater's / Eric Lanlard's / Azelia's Lime Tart. Oh my goodness you have stamina! I think I would have given up after the second pastry disaster. Thank you so much for persevering and I think you need to let @realnigelslater know about the difficulties you had, I'm sure he would want to know. Thank you for joining us for Dish of the Month, I hope you will be back next month. My goodness now you are a pastry expert! I agree with Janice you really need to let Nigel now the issues with this pastry. But what a stunning result. Thanks so much for this monologue. I agree with you about Nigel and his narratives, but when it comes to cooking I run a preverbial mile. His recipes are ricidulous, I am so annoyed with him I wrote to the BBC about his last series telling them how much they had wasted my licence fee. " Have a look in the fridge, throw this in that in, add some beetroot, cover in a packet of butter and it'll taste good." Don't believe a word this man says. Is this tart basically the bottom of a key lie pie with a different base. I love your version so much more, same with tart au citron, as mistakes can easily be covered up with meringue. This is perfectly set though, just calling for a cup of tea! Worth persevering - it's a stunner. Personally, I find a lot of "TV cooks" recipes just awful and avoid them - Nigel Slater and Bill Granger are the main offenders in my kitchen! Most of the pastry recipes I use are WI recipes and they never let me down. This looks absolutely picture perfect. My Mum used to make the most incredible lime tart and whenever I see or eat it, I think of her. This looks just as delicious! Wow, this tart looks so perfect - well worth the effort! Makes a refreshing change to lemon tarts too. I love anything lime! and I admire your diligence in seeing it through! I've yet to find the perfect base, but I might use a biscuit crumb one instead. Or check out Eric Lanlard/Azelias Kitchen for the perfect pastry instead!